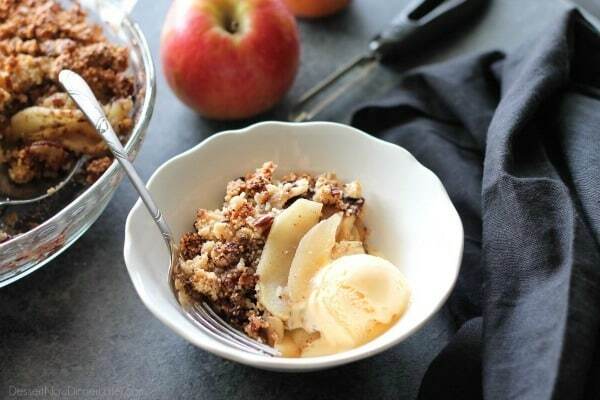 Gluten-Free Apple Crisp - Dessert Now, Dinner Later! 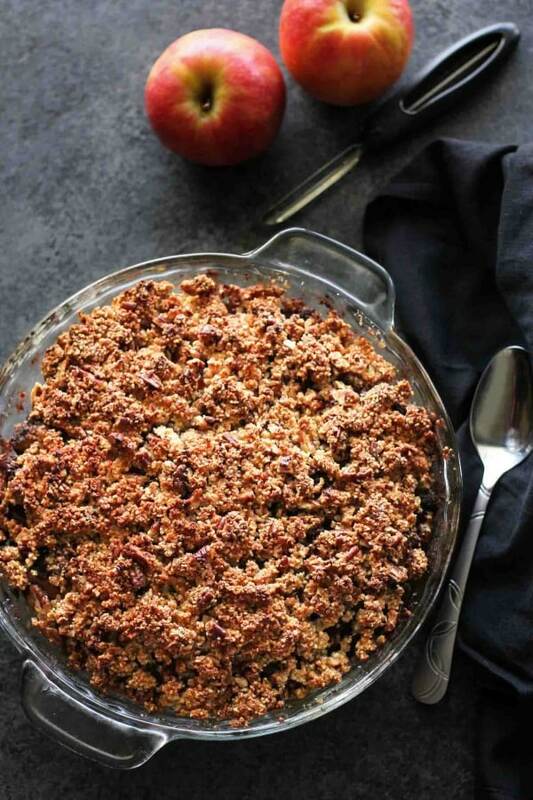 This simple and delicious gluten-free apple crisp is lightly sweet, with a warm hint of cinnamon, and a crunchy nut topping! I live in a valley surrounded by mountains, and the morning air is already crisp and cool. School started for my kids today, and fall is is definitely on its way! 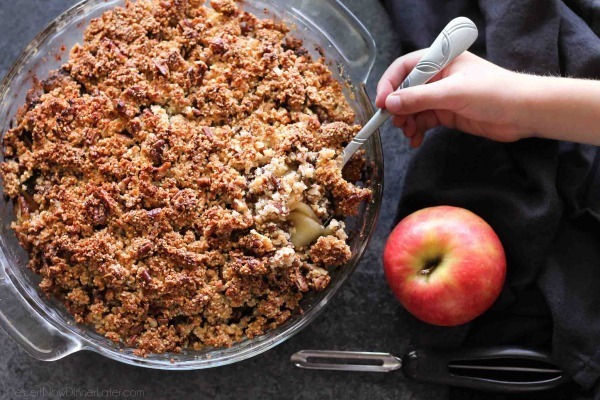 With fall in mind, and apples in season, I thought it would be fun to make a gluten-free apple crisp that is just as tasty as the kind with flour, and this recipe did not disappoint! 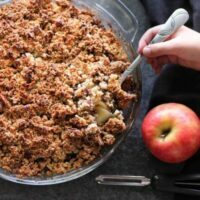 I REALLY liked this gluten-free apple crisp! It’s simple and delicious, lightly sweet, with a warm hint of cinnamon, and a crunchy nut topping. I’m actually not a huge fan of nuts, especially pecans, but I barely noticed them in this dessert. Plus, it was too delicious to stop eating! 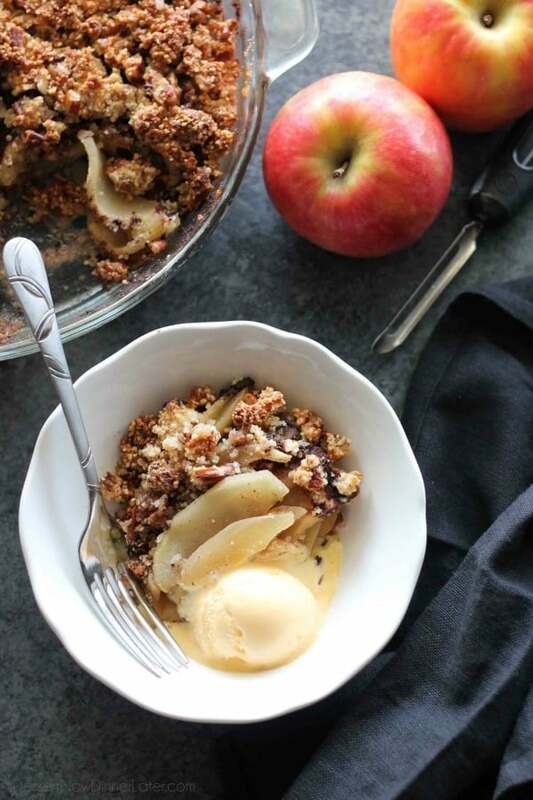 Everything is simple, and elegant with this gluten-free apple crisp recipe. The base is made up of freshly peeled and sliced apples, cinnamon, and a light helping of brown sugar. 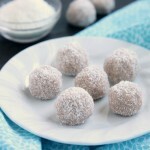 The topping is almond flour, chopped pecans, a little salt, honey, and coconut oil. I think the coconut oil and honey really helped make a tasty topping! It crisped right up and turned a beautiful golden brown color. 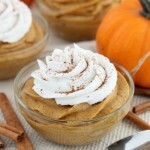 This is one of those recipes that you can enjoy any time of year. 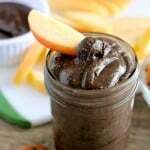 I suggest eating it warm, with a big scoop of vanilla ice cream on top! Perfection! 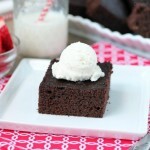 I can’t wait to make this again for my gluten-free sister-in-law! She’s going to love it! Peel and slice apples thinly, about ¼-inch thick. Toss with lemon juice, brown sugar, and cinnamon. Place apples in a DEEP 9-inch pie dish (or 9x9 square baking dish) that has been greased with cooking spray. Combine the topping ingredients in a bowl. Mix thoroughly. Sprinkle on top of the apples. Cover with foil. Bake at 350 degrees Fahrenheit for 45 to 50 minutes, until bubbling in the center and the apples are tender, removing the foil the last 5 to 10 minutes to brown the top.